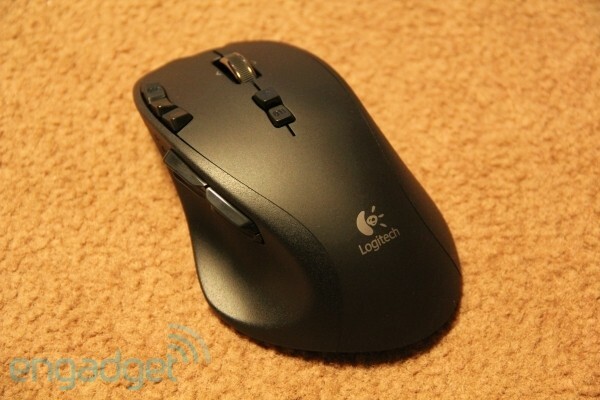 Logitech's been making quality peripherals for as long as many of us have been computing, introducing some of us to our first wheel, wireless and infrared mice in the process. But when it comes to the latest in gaming peripherals, the company's not always ahead of the curve. Razer and Microsoft have had high-end hybrid wireless mice for over a year now, and the 2.4GHz wireless headset isn't exactly a new concept. That said, the company's reputation is strong for a reason, and we were pleasantly surprised to find that Logitech's created a mouse and headset that leapfrog -- rather than just catch up to -- what competitors have offered. See what we mean in our review after the break. 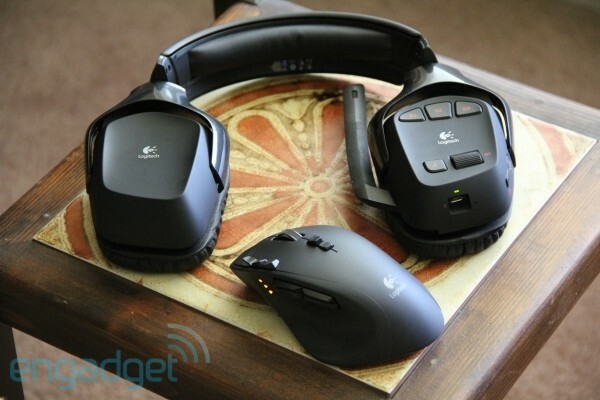 On the surface nigh-identical to Logitech's G35 headset from last year, the $160 Wireless Gaming Headset G930 has plenty more going on under the hood. In addition to Dolby Pro Logic II 7.1 surround sound that kicks in at the flick of a switch and a noise-canceling microphone, the cans can dynamically hop between frequencies thanks to a pair of embedded 2.4GHz radio antennas, and receive uncompressed 48kHz audio from a USB dongle. The dongle itself slots right into a practical circular disc that doubles as a wrap for the headset's microUSB charge cord. There have also been some minor but important tweaks to the headset's general design, with longer steel adjustment bands (that go to 15, if you know what we mean), rotating earcups, and a larger volume dial on the now-concave outer plates. and a handy red mute LED light embedded right into the end of the flexible boom mic. In practice, the wireless connection worked surprisingly well, letting us take our music all around a WiFi-laden house with a minimum of static or noise, and when the connection did cease it was all at once, and always due to wandering outside the unit's range. Of course, if you've never worn a G35, the differences between that headset and this one won't truly help you decide, so let us explain further that the G930 is one of the most superb PC headsets -- gaming or no -- that we've ever tried. We were perfectly audible spychecking in Team Fortress 2 while running a fan at full blast thanks to the noise-canceling mic, and the audio quality from the 40mm drivers was as rich and nuanced as those our favorite Grado SR-60s could provide. The 7.1 Dolby is admittedly more novelty than reality, as there are only two drivers and game support for this particular brand of virtual surround is still limited, but flicking the surround switch does add a certain illusion of depth to even two-channel audio. Besides, it's something of a nitpick when the headset's stereo separation and isolation in two-channel mode let us hear every raindrop in Hero's guqin courtyard fight scene. They're comfortable too, and exerted only a minimum of vice grip on our head, although the weight was noticeable after extended periods. The only true issues we found were with general build quality -- as the arms holding either earcup are made of cheap plastic and tend to creak -- and the ten-hour battery that abruptly cut our music short, rather than providing some audible warning that it required a charge. Logitech's first wired / wireless mouse is something of an anomaly, and that's not just because of its all-plastic shell -- rather than appealing to Call of Duty first-person shooter fans, the $100 G700 is targeted at the MMO crowd. Using the form factor (and nano receiver) of the Performance Mouse MX, the G500's fully-programmable buttons, 5700dpi laser sensor and dual-mode scroll wheel plus extra buttons on top, the result is an incredibly versatile controller that -- at least for us -- was not terribly comfortable to hold. The G700 trades the soft-touch plastic coatings of its predecessors for a rough, textured plastic shell that constantly made our hands feel like sweating as they tried to grasp around the peripheral's large rump, which dug into the base of our thumb when we used a palm grip. With claw or fingertip grip styles our work was easier, especially given the quality of the buttons on this mouse -- more on that in a second -- but tiring, given the weight of the rechargeable Eneloop AA battery and especially with the extra tension of the added data / charging cord. Excepting that tension, the mouse performed equally well in wired and wireless modes (and seamlessly swapped between the two) though we'd suggest using either the cord or the battery for life-and-death tournament use. Speaking of the battery, it did last a couple solid days when idle, but gave up the ghost after a severe Engadget work day of very heavy use. Now, we told you these buttons were fantastic, and we weren't kidding around -- the positioning, responsiveness and flexibility impressed us at every turn. The four triggers on the left side have ridges aligned so that you can press any individual one just by slightly shifting your thumb, and the main left and right mouse buttons require so little effort to depress that you can activate them at the apex of the mouse. With a single finger at the right point, you can press any of three left mouse buttons with a single touch -- with the proper grip, only G8, G11 and the dual-mode scroll wheel shifter require any effort to reach. Furthermore, every single button on the device is fully programmable to be a macro, keyboard key or Windows function and you can store and switch between five full profiles of these programmable buttons on the mouse itself, giving a fairly impressive (and admittedly difficult to remember) total of 65 different functions across three modes. We quickly whipped up a productivity mode with copy, paste, task switching, media remote buttons and web shortcuts mapped right to various keys on the mouse, and a gaming mode where we could switch sensitivity, instantly select weapons and reload. Of course, these could just as easily help a rogue rapidly put on a robe and wizard hat, we suppose. Finishing up a lengthy test, we went right back to our aging Logitech MX518 mouse and Grado cans, and found them just as comfortable and pleasing to use as before -- they're not broken, and until they are we wouldn't spend nearly what Logitech's asking for the G930 and G700. But we do already miss the extra buttons and superb wireless sound. If you're due for an upgrade, only the slightly steep price, middling battery life and your-mileage-may-vary comfort concerns keep these both from being must-owns. Update: Our bad, the red LED on the end of the mic is a carryover from the G35. Also, in case you're wondering, both devices work perfectly well with Mac as plug-and-play USB peripherals, though you won't be able to program buttons or enjoy Dolby surround without hacking your own drivers. 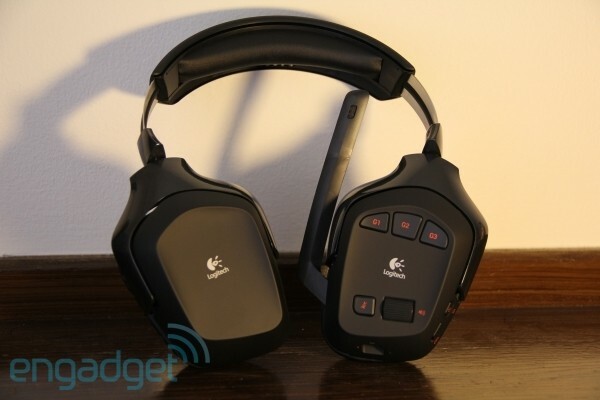 Update 2: While the G930 headset doesn't have dedicated hardware for either function, Logitech informs us that a low battery notification is indeed available using the companion desktop software, and you can always program one of the three G keys to be an audio mute if that's what you desire. The G700 mouse, meanwhile, has space for five onboard profiles, not just three, and you can keep track of which one's active by looking at those three LEDs on the left side.